What are people saying about New Directions? New Directions for people with disabilities, inc. is a 501(c)(3) non-profit organization providing high- quality local, national, and international travel vacations and holiday programs for people with mild to moderate developmental disabilities. New Directions believes that people who have disabilities deserve the same opportunities in life that others expect and enjoy. Our‍‍‍ profoundly enriching travel programs expand the self-esteem of every traveler. Whole new worlds of understanding open‍‍‍ for both participants and the general population. Through these unique programs, people with disabilities are increasingly understood, appreciated and accepted as important and contributing members of our world. New Directions believes that people with disabilities deserve the same opportunities in life that most of us take for granted. We provide an atmosphere in which people with disabilities are accepted and treated as individuals, exploring new worlds in an environment of love and respect. All our travel programs are specifically designed to give our participants the opportunity to enjoy both the simple pleasures of everyday life and the special joys of new experiences. Learning, forming new friendships, discovering hidden talents and achieving personal breakthroughs are just part of what a New Directions tour is all about. We strive to offer each person the maximum opportunity for choice, independence, socialization and the application of practical living skills. Of course, we don't forget to add a solid dose of just plain old fun. New Directions for people with disabilities, inc. is a fully insured non-profit organization overseen by a dedicated volunteer Board of Directors. New Directions, Inc. (NDI) is a registered Seller of Travel in the State of California, #2113686-40. NDI is also a participant in the California Travel Consumer Restitution Corporation, #601444. Each year we serve over 650 teenagers, adults and seniors who have brain impairments such as mild to moderate intellectual and developmental disabilities, cerebral palsy, Down Syndrome and autism. 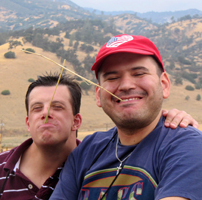 Since 1985, we have taken over 18,000 people with special needs on tours all over the world. New Directions annually sponsors trips in the United States and abroad. Previous excursions have included Australia ~ Hawaii ~ New Zealand ~ Washington D.C. ~ Bahamas ~ New York City ~ Ireland ~ Las Vegas ~ Israel ~ Disneyland ~ Japan ~ Grand Canyon. Skiing ~ Biking Tours ~ River Rafting ~ Hot Air Ballooning ~ Kayaking ~ Snorkeling ~ Sailing ~ Surf Camps. The Tour Guides are special educational instructors, recreation therapists, residential counselors, vocational and independent living skills counselors, and other professional staff who have been trained to work with people with developmental disabilities. All tours are subsidized through donations. New Directions tours are exceptionally high quality. Preparations include extensive research, fully custom arrangements, hundreds of safety-related details, medical/behavior reviews and individual attention. Staff-to-traveler ratio ranges from 1:1 through 1:4. We feel these labor-intensive preparations and ratios are essential to ensure a safe and normalized experience. To help keep fees down, we use volunteers and solicit donated goods and services whenever possible. All tours are subsidized through donations. Full and partial travel scholarships are provided for those with financial need. As a non-profit organization, we depend on the community and like-minded individuals to help us achieve these goals. New Directions would be delighted to count you as a supporter. If you would like further information, please don't hesitate to call or write. We look forward to hearing from you.